Two British championship-winning pilots have been killed in a helicopter crash in southern France. Martin Rutty, 50, from Little Hereford, and Simon Lichtenstein, 49, from Bircher, in Herefordshire, died on Thursday. Tributes have been paid to the men, who were described as "larger than life" members of the British Helicopter Team. A Foreign Office spokeswoman said next of kin had been informed and consular assistance was being provided. An investigation is under way into the crash, which took place near Tourrettes-sur-Loup. Both men leave behind wives and children and members of each family are due to travel to France in the coming days. British Helicopter Team manager David Monks said the men had been two of the most popular and active members of the Helicopter Club of Great Britain. He said: "They were both extremely capable pilots and joined forces in 1999 to join the British Helicopter Team with Martin flying and Simon co-piloting their Robinson R22 helicopter. "They went on to gather many competition accolades, winning the British National Championship event on four occasions and were part of the British Team that won a bronze medal at the World Helicopter Championship in Eisenach in 2008. "Not only have we lost two great competition pilots, we have lost two very dear friends who will be very sorely missed by all of us. "We shall all miss their larger than life characters. They simply loved flying and brought their infectious passion to many." The men crashed shortly after take-off from the French town of Sospel near the Italian border, while heading towards the Provencal city of Avigno. They were flying the Robinson R22 craft back to the UK after it had been on display in an Italian showroom. Witnesses in the village of Tourrettes-sur-Loup described seeing the aircraft go out of control and crash into trees below. Reports indicate it suffered a catastrophic mechanical failure at a time of strong headwinds. Nice's air transport police said the men, who were directors of Herefordshire-based helicopter company Fly-Q, would have died instantly. 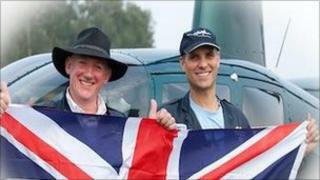 In a statement the company said: "Martin and Simon have been long-term pilots, flying together since 1999. "They were highly experienced pilots, having held four British championship titles and represented the British Helicopter Team in the past four World Championships, most recently in Belarus. "Our thoughts and sympathies are with Martin's and Simon's families."